The flip-up helmet for sporty touring drivers. Comfortable and proven 100,000 times. High-quality materials. thought through operator friendly functions. Tested thoroughly – for your safety. technical in-depth knowledge and years of experience turn the C3 Pro into the functional wonder that it is. For years the C3 Pro has been the most popular helmet in the Schuberth lineup. Universally adept with regards to functionality, comfort and protection. The C3 Pro is a flip-up helmet which is as suited for long tours as it is in the fast stretches. The C3 Pro is in accordance with the DOT 218 testing standard, making it road legal throughout North America. The C3 Pro is available in sizes from XS to 3XL. This model helmet conforms to head circumferences from 19 1/2 inches to 25 1/2 inches. SCHUBERTH’s proprietary outer shell technology combines low weight with optimal stability. Fiberglass with a special resin additive is pressed into the shape under high temperature and pressure. The result is an extremely strong helmet shell. The inner shell is constructed of multiple pieces of high rated EPS foam which enables higher impact reduction and greatly increases the safety of the helmet. COOLMAX® textiles are used on the inside of the helmet to create an optimal climate. The liner wicks away moisture and helps in conjunction with the ventilation system to keep the helmet at optimum temperature while riding. All the inner liners of the C3 Pro are OEKO-TEX® standard 100 approved meaning they are ensured to be free of harmful chemicals. The liners are also removable and washable to keep your helmet fresh no matter how much you use it it. The ratchet lock makes for a quick and easy adjustments and the length of the chin strap can be adjusted on both sides for an ideal fit. The ratchet system is tested and proven to be just as strong and secure as double d-ring systems. The external shield is made from scratch-proof polycarbonate, manufactured in the injection molding process. The clear shield passes optical class 1 standards, meaning this is as clear and free of distortion as it gets. Change to a tinted shield in seconds, and insert the anti-fog pin lock for a mist-free ride. Crafted by our engineers in the SCHUBERTH wind tunnel, the C3 PRO is optimized for aerodynamics. The result is a smooth and stable ride with no lift or buffeting, even at higher speeds. The C3 PRO is one of the quietest helmets in the world. The ergonomically shaped neck roll is designed in conjunction with the chin skirt to reduce wind noise passing under the helmet. Turbulators on the visor help minimize noise and prevent whistling when the visor is open and diffuse wind noise passing over the top and sides of the helmet. The result is a quiet ride and less distraction from the road ahead. The internal sun visor can be extended or retracted with one hand by using the slider on the edge of the helmet. Now you can react lightning quick to sudden sun glare. 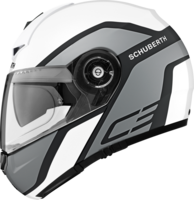 Like all SCHUBERTH helmets, the C3 PRO has reflective pads at the bottom of the collar, and logos and accent stickers are reflective for additional visibility. Be seen at all times on the road. Permanent air circulation means uninterrupted fresh air inlet. The head aeration and the indirect visor aeration lead the air further into the aeration channels of the EPS inner shell and distribute the breathing air evenly in the inner part of the helmet. The ventilation openings can be regulated. An air outlet at the back warrants a constant air stream. Protect your helmets and keep them safe with the official Schuberth Helmet Bag. The Helmetlok provides security and theft prevention for your Schuberth helmet. The carabiner-style lock will secure your helmet to any model bike! Replacement cheek pads for the Schuberth C3 Pro cheek pads. Replacement cheek pads for Schuberth C3 Pro for Women helmets. Replacement for the inner Sun Visor for your Schuberth M1, M1 Pro, C3,C3 Pro, S2 Sport, E1, C4 and C4 Pro Helmet. Wind deflector for Schuberth C3 Pro helmets.